It’s the summer of 1974. I was 14 years old and spending the summer in the beautiful, rolling hills of Eastern Tennessee. Like all teenage boys in those days, I was rocking out and playing air guitar to many of the great, straight-forward rock and roll being produced at that time. It was during those days that I heard a brand new band that was taking the country by a storm with their bone-jarring, thunderous music. But what was also commanding the world’s attention was the mystique they created by only being seen in public with their uniquely applied kabuki stage make-up. Their fan base was legion almost instantaneously and they quickly were referred to as the “KISS Army”. Each of the band members had their own distinct “mask” that was painted on for each performance. Commanding the bulk of the limelight was the blood-spewing “demon” bass player, Gene Simmons. Next in command was Paul Stanley, the “Star Child” who often shared the spotlight with Gene while playing rhythm guitar. The foundation for that rhythm was provided by drummer, Peter Criss, whose character was the “Cat Man”. However, the opinion of most guitarists who know these things, the person who was providing the prolific guitar work in almost every technical sense of the word was Ace “Spaceman” Frehley. While Gene and Paul commanded most of the visual attention, musicians and musician wannabe’s were captivated by Frehley’s blistering licks and pyrotechnics emanating from his guitar. Of course, we all know that KISS went on to accomplish international fame for their music and antics on, and off, the stage. Eventually, the make-up went away but the band continues as a wildly successful musical and marketing sensation. Well, members of the KISS Army, you’re going to be absolutely jumping with joy to learn that Ace Frehley has come out with his first album in twenty years! 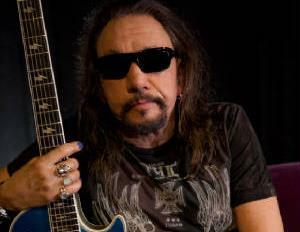 It’s titled, “Anomaly”, and it’s about this project that my interview with Ace Frehley begins. Hoping to get a little inside scoop from Ace, I asked if the song, “Pain In The Neck” is about anyone in particular. Laughing, he shoots back, “What do you want to do? Get me in trouble or something?” Hoping for at least a little be of juicy gossip, he chooses to leave me hanging on that one. It’s honestly hard for me to pick a favorite cuts off of “Anomaly” but one that would have to be on my short list of top picks is “Space Bear” and the iTunes bonus track, “The Return of the Space Bear”. I asked Ace what was the story behind those tunes. Another great cut from the disc is an acoustical instrumental number entitled “Fractured Quantum”. Ace fans will immediately notice that, as in the case of “Fractured Mirror” (from “Ace Frehley”) and “Fractured Too” (from “Frehley’s Comet”), 12-string guitars form a catalyst to the tunes. I asked Ace about the significance of the 12-strings and what gear he used to play the tunes. His answer was interesting. Remember, Ace fans, you hear it here first!